Our charming French Farmhouse Villa and holiday cottages are nestled in a country lane, 500 metres from the banks of the Dordogne river. Set in the heart of the Dordogne valley, a beautiful landscape of rolling hills, cliffs & forests, the picturesque villages of Meyronne and Saint Sozy are less than 2 kms away. Both villages offer excellent restaurants, a boulangerie and shops. Our accommodation is full of character, original charm and is beautifully finished. This property has a beautiful swimming pool that is shared with two other holiday cottages located on the same property. The two other holiday cottages sleep a maximum of four people each and are also available to rent separately at different rates (please get in contact if these options are of interest to you). The two other holiday cottages, like The Farmhouse (pictured) also have their own private garden areas. The Farmhouse (pictured) is a bright and spacious holiday accommodation spread over 3 floors, and has 4 bedrooms and 2 bathrooms, and sleeps 8 people. This traditional 18th century French farmhouse has been carefully restored and retains its original charm and character. There is a private garden area, with outdoor seating, table, parasol and BBQ. The farmhouse has a spacious dining area, featuring an original stone fireplace. The large sunny kitchen is completely appointed for self-catering holidays, and includes a dishwasher and washing machine. The large lounge, with wood burner and satellite television leads directly onto a private garden. The master bedroom of the French farmhouse is located on the first floor, with a king-size bed set under exposed roof beams. Adjoining the master bedroom are two further twin bedrooms and a unique bathroom, with the bath set in the original pigeonnier- a distinctive architectural feature of our region. On the lower ground floor the Farmhouse also has a study room, en-suite bathroom (with shower) and a large double bedroom with French doors leading directly to the private garden. All cottages have a private garden area, with outdoor seating, table, parasol and BBQ. Laborie is such a beautiful and welcoming holiday home. Cécile and Sean helpfully provided us with information about the area and tips on places to go. 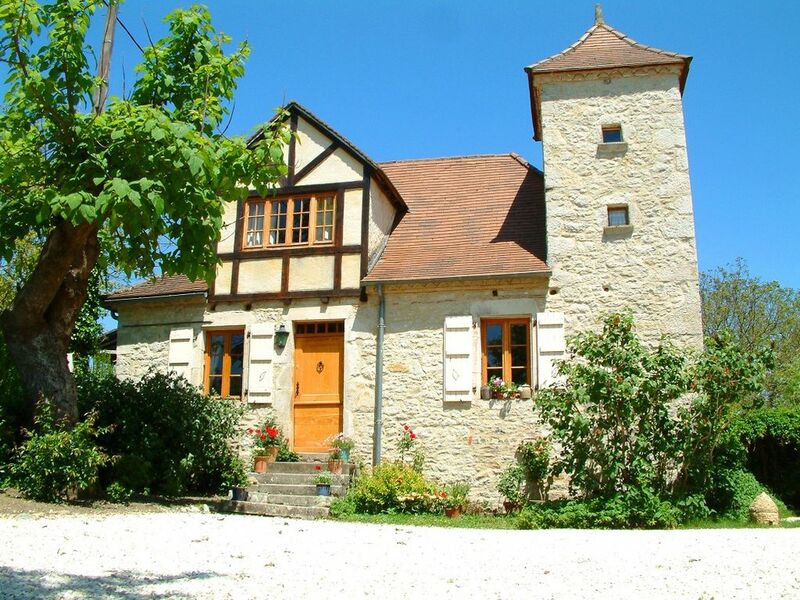 The house is located very close to the small village of Meyronne and the Dordogne, and within easy travel distance of caves and traditional French villages if you want to explore. Otherwise the pool and scenic views from the garden are perfect if you'd prefer to put your feet up and relax. We visited as a family in August with parents and children and all of us agree this was an amazing holiday. Would love to come back! . "Wonderful accommodation and spectacular setting! The owners are very welcoming and ready to help in every way! Very well positioned for all the great places to see and the countryside! A happy place to stay! I would definitely go back again!" "We stayed in the Bread Oven which had been beautifully renovated and was very well equipped and spotlessly clean. The location was delightful and very peaceful - just a 20 minute walk to a bar/restaurant in Meyronne on the banks of the Dordogne river or, if you want a longer walk, on to St Sozy. There is loads to see and do in the Dordogne/Lot area or just you could chill-out in the garden or by the pool at the Laborie. I wouldn't hesitate to recommend this accommodation to others. Cecile and Sean were the perfect hosts - and we had a really great stay there." We loved our two week stay at Laborie. It is exactly as advertised and even more beautiful than the photos suggest! It is a fantastic place for kids, they loved the pool and were never bored. Apart from some great castles and sightseeing, there were heaps of activites they enjoyed such as tree climbing, monkey park nearby and a spectacular eagle show at Rocamadour. Our hosts were always helpful and had great suggestions on what to see and do. A fantastic place for a family holiday. "A stunning location matched only by the standard of the property and welcome from the owners Sean and Cecile. 2009 will be our 3rd year of returning to Laborie - scenery, food (drink! ), relaxation, sun, culture...it remains our key 'wind down' vacation of the year. Since we first visited we have returned with family in tow and we do so again this year. Rocamadour never fails to take our breath away, or the view over the Dordogne from Domme. We dined at La Terrasse last year, and it is really something special, but a 10 minute walk into St. Sozy will get you an excellent cassoulet or confit, in the more informal atmosphere of the local hotel. The opinions never differ - if you want a warm, welcoming, peaceful holiday with all that rural France has to offer, then a visit to Laborie and the surrounding area is a must." "Laborie was set in the most peaceful surroundings & the views were lovely. We did not experience any noise other than the odd tractor. (Fantastic)The property was spotlessly clean & there was no problem accessing it. The pool was good with beds around & the garden had outdoor furniture & barbecue." * From Toulouse Airport: 1 Hour 50 minutes. Alternatively, you can take the Paris Toulouse service that stops in Souillac, 15 minutes drive from our location. Easily reached by the A20 motorway Laborie is 818kms (7 hours,45minutes) from Calais; 681 kms (7 hours,15minutes) from St Malo; Cherbourg 745kms(8 hours). Our cottage is located in the heart of one of the most beautiful and unspoilt parts of southwest France - The Dordogne Valley - making it the ideal base for sighseeing and relaxing. From the era of Prehistoric Man through the Middle Ages and beyond the Dordogne is a sightseer's paradise - steeped in history. The Perigord boasts numerous castles, churches and medieval bastides towns as well as beautiful stone villages and prehistoric caves, all set in some of France’s loveliest countryside. Explore the ancient town of Sarlat, or discover the castle Beynac.and wonder through ancient narrow streets bursting with local produce on market day. Discover the second most-visited site in France, Rocamadour - a medieval treasure that is literally hanging off the cliffs of the Alzou canyon. Enjoy the fun of canoeing down the river, which winds through breathtaking valleys. Visit the prehistoric caves of Lascaux, where extraordinary cave paintings (17,000 years old) tell the tales of prehistoric man. The rich and abundant culinary tradition of the region ensures a wealth of gastronomic treats, and a vast choice of markets, shops and amazing restaurants. The Dordogne valley is also a fantastic family friendly area, full of fun leisure activities for kids, including pot-holing, rock-climbing and horse-riding. All of these leisure activities, and more, are very close by - so no one will get bored in the car!